Thinking of paying us a visit? Well, stop thinking and do it. We like welcoming new people to Rectory Meadow or "The Ranch" as it has become known locally. Over the years we have gained a reputation as being steadfast in supporting our team, but we have also earned a reputation as a welcoming and hospitable club, so go on, come down to a game. Before you do, check out the following for info on what you can expect. Detailed directions to our ground can be found on the"Where R We" page in the Club section of this site but it's pretty true to say that the most difficult part of the journey is actually finding the ground once you have turned into Park Road. Rectory Meadow is at the very end of Park Road. Go down the road until you come to a tight left hand bend. You need to go around that bend, and to ignore the entrance on your right which is Feltham Rugby Club. Continue down the road. If you are walking you will see a pedestrian gate on your right with a path to the clubhouse. If you are driving, keep going until you are faced with the side of the motorway flyover. You will see the entrance to the car park on your right. There is a parking area which, if people park in a sensible manner, is capable of holding up to 100 vehicles. It should be noted that this is not a purpose built car park and the surface is not the best. Please be aware of the pot holes especially at the entrance ramp. The car park is not the responsibility of the club and anyone using the car park does so at their own risk. 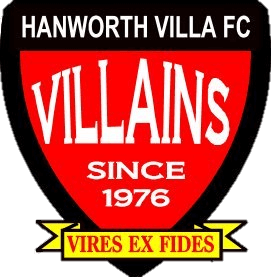 Hanworth Villa FC will not accept liability for any accidents, damage or losses incurred. Please ensure that you lock away or remove any valuables. Do not leave on show any articles that may be attractive to thieves. Entry to the ground is via "The Marylin Munro" turnstile. So called because a picture of the club's mascot Marilyn, resplendent in Villa shirt, adorns the rear of the turnstile. Rectory Meadow has a capacity of 1000, including 100 covered seating and 80 covered standing. The floodlit pitch has a post and rail barrier and hard standing on each of it's 3 accessible sides and there are toilet facilities along side the turnstile. A selection of hot and cold refreshments are available from the "Snack Window" which is located to the left of the players walkway as you look at the club. Our snack bar opens 1 hour before kick off on match days. It should be noted that there is no entry into our bar area from inside the ground until after half time. 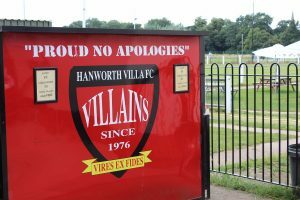 Should you wish to have a drink or use the clubhouse before the game you should gain entry via rear entrance and not go through the turnstile. On Saturday match days our clubhouse and bar, is open from 12 noon. For evening matches it opens at 4pm. The club house also includes our snack bar which serves it's full range of hot and cold refreshments from 1 hour before kick off. Our bar is open every day, except Monday, and is a popular venue with the locals and also with the supporters of the sides that visit regularly. The bar is always fully stocked and supply's Fosters, Kronenberg 1664, Strongbow, John Smiths and Guinness on draft. We also have a wide selection of bottled beers including, Budweiser, Stella, Becks, Peroni, Bulmers, Corona, Doombar, Pedigree, and Speckled Hen. On occasions we also have a guest keg for real ale lovers. Whilst drinking your pint and eating your burger you can relax and watch one of our wide screen TV's which show all the live football you want. You really have no excuse for not turning up early, or staying behind late, when you turn up to watch "The Villains" in the flesh. We hope this little read has made you feel like popping down to one of our games, we'll certainly be pleased to see you. If there is still some information you're missing please do not hesitate to call the club on 0208 893 9391, our club steward will be only too happy to help you.